Gaining admission to a medical residency, medical, law or business school as well as graduate school on the whole is more competitive than ever. You want to make sure that you have the edge over other applicants. One surefire way is to submit a thoughtfully crafted personal statement. Now, writing a personal statement, or application essay, can be the hardest part of applying to graduate or professional field. This guide shows how to write a personal statement correctly, revealing the latest personal statement questions used by top residency programs, law, business, medical, and graduate schools. Write about family, education, talents or passions. They want to hear about significant places or events in your life; about books you have read, people you have met or work you’ve done that has shaped the person you have become. Make it interesting! The personal statement is your last chance to tell the admissions committee who you are and why they should accept you. What will you contribute to their program or school? 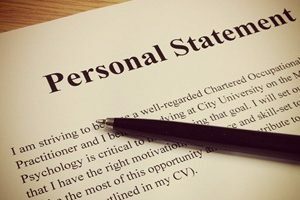 Remember, every institution is different, so each personal statement should be different. Write something unique about the geographical location or program. For example, if you have someone living next to the institution, you can mention that your close relatives live next to the institution and you want to stay close to your relatives. One of the worst things you can do is bore the admission officer. Make yourself memorable by telling an interesting story related to your reasons for applying. Why do you want to study this course? Make sure you do your research about what the field really do. Explain the unique ways the institution can help you. End with an interesting afterthought. You can write a sentence or two about your future plan once you will complete your course. Read your personal statement multiple times to make it error free. Hire a professional to go over your personal statement so that it is polished.